New Blues radio show being produced by Martin Puljic in Cleveland, Ohio USA starting August 31st. Martin Puljic, a former American Croatian Business Association, President, and VP of Public Relations of Group 100, is independently producing a Blues music radio show for WJCU near Cleveland, Ohio USA. It will be on WJCU 88.7 FM on Tuesday's from 8-10PM EST beginning August 31st. The broadcast will also be available via the Internet through audio streaming at http://www.wjcu.org. The show will emanate from the campus of John Carroll University in University Heights, Ohio. It’s the same university and radio station where the late journalist Tim Russert got his start, and where football legend Don Shula is another notable alumnus. Martin’s name on air will be “Madcat Blue”. He acquired that nickname when he was at a blues club in Cleveland a few years ago having a heated discussion with a friend about a certain news topic. Then a man sitting at the bar next to him turned and said, “Man, you are one mad cat!” So the name stuck. Martin has also been on air at WERE in Cleveland, and is among the originating founding members, and current VP of the Cleveland Blues Society. He also plays the electric bass, and has performed in a number of rock, classic rock, doo-wop, and blues bands throughout Greater Cleveland. Therefore he brings a lot of first-hand experience from the stage to behind the ‘mike’. 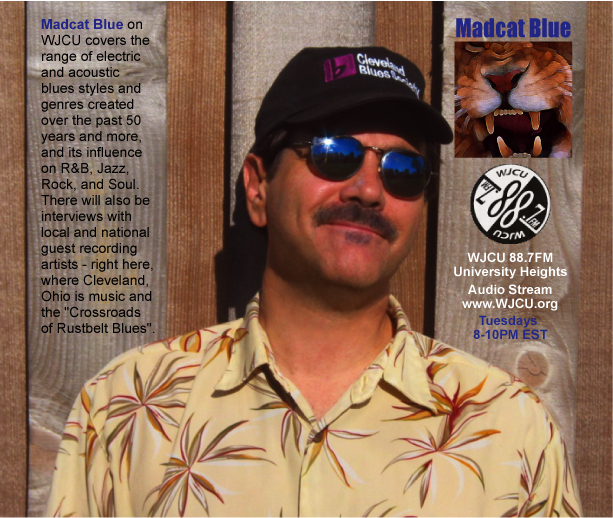 Madcat Blue on WJCU will cover the range of electric and acoustic blues styles, and various regional blues genres created over the past 50 years and more, plus its influence on R&B, Jazz, Rock, and Soul. There will also be interviews with local and national guest recording artists - where Cleveland, Ohio is the city of Rock music, and the "Crossroads of Rustbelt Blues".